Every Wednesday through August, you can get a $1.50 coupon for Planters Flavor Grove Almonds. 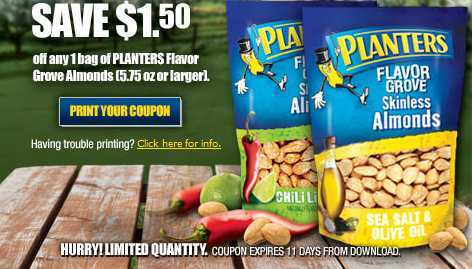 Go to Planter's Facebook page and click the "coupon" tab. The coupon has a limited quantity available every Wednesday and is first come, first served so hurry to print yours if they are still available! of switching to wastewater treatment and recommend you the same.